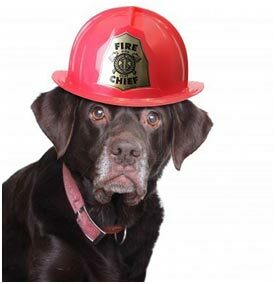 From Wichita, KS, comes a story of many brave firefighters, one scared owner, and a terrified dog. John Huy, a retired aviation engineer, was walking his 100-pound pit bull/Labrador mix,Taz, in the rain last month. Huy and Taz took cover underneath a bridge that spanned a creek and culvert as the rain increased. Lightning flashed and thunder pealed, and Taz, afraid of loud noises, got antsy. Huy let him off his leash, thinking less restraint would calm the terrified dog. Taz then jumped into the creek, and scrambled under a ledge along the sidewalk under the overpass. As the water rose, the ledge closed off, trapping Taz in a small air pocket. Huy jumped in the hard rushing water to try to rescue Taz, and was joined by Tod Parent, a man he’d just met. Together, they tried to coax and pull Taz from the air pocket as the water rose. A passerby saw the two men struggling in the creek, and called 911, reporting a submerged car with people possibly trapped. The Wichita Fire Department responded. Once they figured out there was no car, and no people to rescue, they got busy rescuing Taz. Two of them got in the water, using their hands to probe for air pockets. After a long time searching, Capt. Michael Wells called a news conference to tell the bad news – Taz had disappeared, and would probably never be seen alive again. The firefighters packed up their gear.